In ‘The Red Soldier’ my main purpose was to illustrate the first-hand evidence that lies in a specific course of information, namely the private letters written by soldiers who fought in the Anglo-Zulu War. (1) In this paper I wish to take the exercise further by drawing on fresh letters that have come to light since the book was published in 1977. I wish also to assess the strengths and shortcomings of the letters in general as data for studying the Campaign. And how to whack a cricket ball. All we are looking for here, however, is a basic threshold of literacy, and this we can take for granted. Indeed, when I looked into school magazines such as the Eton College Chronicle for 1879 I discovered several letters from young officers fighting in Zululand, who had left school a few years previously. (4) Nor should we forget that ten per cent of our samples of officer casualties had been at university. Four of them were killed on the same day at Isandlwana: Vereker was at Oxford, Melvill at Cambridge. Cavaye (also of the 24th Regiment) was an Edinburgh graduate, and Surgeon-Major Sheperd was trained at Aberdeen University. (Incidentally, he is still remembered there through the Shepherd gold medal for surgery, instituted by his friends; it was won, I am glad to say, by one of my medical advisers in 1952). It is less easy, but by no means impossible, to determine the letter-writing potential of the non-commissioned officers and the rank and file of the British Army at this time. My attention was rightly drawn to this problem by certain reveiwers of my book, one of whom headed his piece with a pun, ‘The Well-Read Soldier’. (5) One should try to face the question of how many ordinary men were in fact capable of writing letters to their relatives and friends at home. It is a tantalising calculation. Long before the Anglo-Zulu War there are splendid instances of this facility. For example, we have Private Charles Godward who fought throughout the Sikh Wars with the 16th Lancers. (6) He wrote at length of his part in the battle of Aliwal (28 January 1846), concluding ‘I hope sincerely that in the next engagement I may come out as safe as this, without a scratch’. Was Godward somehow exceptional, or were there others like him, and if so, how many? A.R. Skelley gives some necessary figures about army education 30 years later in his recent book ‘The Victorian Army at Home’. (7) Admittedly, these statistics are derived solely from military sources that may have had an axe to grind, but we have to use them. They claim that 42,7 per cent of the rank and file could read and write in 1878. In addition, 48,8 per cent had the kind of educational standard, geared though it was to the modest demands of the fourth-class army certificate, that enabled them to draft a letter. Of those recruits entering the army in 1877, 76 per cent were able to read and write. Serious attempts were being made to improve the educational service within the army. Soldiers had to attend school for five hours each week, although their effectiveness varied from regiment to regiment with the commanding officers’ interest in such matters. Promotion to corporal, however, required a third-class certificate of education, and I was impressed with a comment made by Private George Morris, 24th Regiment (killed at Isandlwana) when he wrote to tell his mother about a lance-corporal comrade: ‘hope he will get on, but he is a very poor scholar, that is a great drawback to him in the service.'(8). Reviewers of ‘The Red Soldier’ also questioned the extent to which the editors of local newspapers might have changed the soldiers’ letters that came into their hands for publication. It goes without saying that editors invariably reserve the right to tidy up spelling, improve grammar and puncuation, correct or standardize the proper names appearing in their raw copy. To a varying extent, some of the letters handed to them would need such cosmetic treatment. But I wish to suggest that in any case a built-in selection process was at work: only letters that were reasonably well-written and had something worth reading in them would be brought to the editors’ attention. Thus we are talking here about the best sample for which the editors had least to do. So far I have been able to compare the original letters with the version that appeared in a newspaper in only one instance. Lieutenant Charles Commeline served in Zululand with 5 Field Company of the Royal Engineers, and wrote long letters to his father at Gloucester, on average once a fortnight. Several of them were handed on for publication to various local newspapers, notably to ‘The Citizen’, an evening paper in Gloucester. One of them is included in ‘The Red Soldier’, and comparison shows that the editors kept faith with the original. The main drawback is their omission of the paragraphs from the letters, for reasons of space. In Commeline’s case, this was later more regrettable in a very long letter he wrote while besieged in Pretoria, in February 1881, because the editor left out his accounts of sorties in which he had participated. Perhaps the best sequence of British soldiers’ letters that I have found recently in a provincial newspaper comes from ‘The Sheffield Daily Telegraph’. (12) This paper had a surprisingly full coverage of the war because it had its own ‘Official Correspondents’ with most of the fighting columns. I suspect they would have been officers who initially had their letters printed and who were then paid for regular contributions. Of the private letters, an informative series appeared from the pen of Corporal George Howe who served in that most literate of all the army corps, the Royal Engineers. He shows us the full impact of military events at a personal or small-unit level, something that cannot be readily derived from other sources, especially for those on the sidelines of major engagements. Essential detail, then, is the first gain from these letters, as possible ingredients in the whole psychological picture of the war, and our understanding of it. By 05h00 Howe and his comrades were marching bravely on; after covering 22 km they were about to pitch camp when a messenger arrived with the news that 30 wagons filled with ammunition stood undefended at Sand Spruit. So on they had to go until 22h00. 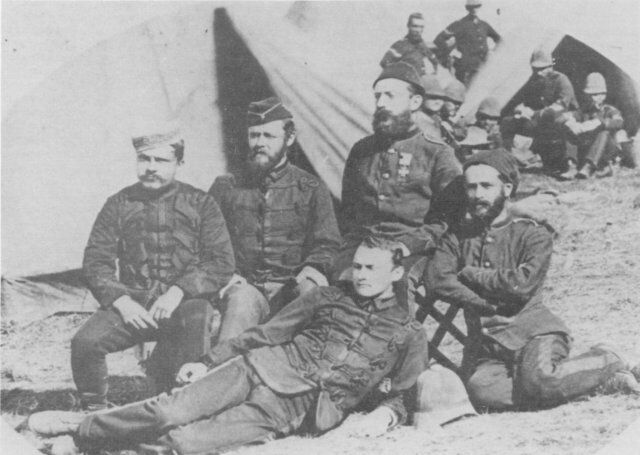 On 24 January they built a makeshift fort at Sand Spruit where, according to Howe, they had an attack, but it only lasted about twenty minutes; we had one wounded. Four days later they marched to Helpmekaar, and so on to Rorke’s Drift. There they had to help in the construction of another and much stronger fortification, as the entire British army recoiled upon its bases and dug in. It was the same story the length of the front, from Wood’s emergency laager at Kambula, to the entrenched settlements and supply posts, to Helpmekaar, and to the coastal column, with Pearson’s force bottled up at Eshowe and others on the defensive at Fort Tenedos. The Zulu gibe that the red soldiers had been changed into antbears was well justified. Fear of renewed attack runs through the soldiers’ letters after Isandlwana, succeeded by the extreme caution that their commanding general took so long to throw off. Another merit of the letters is their capacity for fixing the exact chronology of events near to the date on which they were written. They have the immediacy of a well-kept journal, such as that of Captain Henry Charles Harford, of the Natal Native Contingent and the 99th Regiment; as the recent edition of his journal plainly shows, however, at a later date Harford transformed his daily record into a continuous narrative, thereby reducing its particular value. It is difficult to understand otherwise why he should state that Cetewayo, after his capture, was taken to Pietermaritzburg in a mule cart; the fact is he went to Port Durnford and thence on board ship to Cape Town. (17) Where but in the letters can we catch the full flavour of the day-to-day movements of the British army as it resumed its slow advance towards Ulundi? At once all the old fears and caution were revived by the killing of the Prince Imperial on 1 June, particularly among the newly-arrived battalions that numbered many young, half-trained soldiers in their ranks. Nerves were stretched to straining point, as witnessed by a series of panic situations where the troops fired by mistake at their comrades. First among the victims of this circumstance were our old friends, 5 Field Company, Royal Engineers, then attached to Wood’s redoubtable Flying Column. On 5 June Wood’s advance guard ran into Zulu opposition at the Ipoko river, and suffered casualties; as he wished to camp there to wait for supplies to come up, he decided to fight. First he detached the Engineers and sent them back to Newdigate’s column, in laager with hundreds of wagons about 18 km to the rear. The sappers were to build a strongpoint for defending the store depot, so when they arrived at 18h30 on 6 June they pitched their tents on site and began work, well outside Newdigate’s laager. About 22h00 they were awakened by shots and dived into the protection of the walls, only ,61 cm high, on which they had just begun working. They heard the outlying picquets fire three volleys, saw them retreat, and persuaded them to shelter within the walls. At once they all came under heavy fire from Newdigate’s laager. Corporal Howe relates the story of what happened next in this dangerous and farcical situation: ‘ “Good heavens, they are taking us for the enemy. Under cover at once!”, cried Chard, the hero of Rorke’s Drift. It was not safe to move. The buglers sounded the cease fire. Our men got over the wall to rush on the laager when they, taking us for a rush of Zulus, poured another volley into us. Back we had to go helter-skelter over the wall. Men jumped on to one another and were lying huddled in hopeless confusion, whilst shot was pouring into us like hail. Before it ceased five Engineers (including a sergeant and two corporals) had been wounded. Next morning we found the stones on the wall covered with lead and bullet marks. The artillery told us they were just going to fire when they heard our bugle sound. If they had, not one of us would have escaped’.(18). Lt John Rouse Merriot Chard, VC, one of the heroes of Rorke’s Drift, together with a group of other officers from the Royal Engineers. Chard is wearing his Decoration. The best instance of revelation by letter comes from the battle of Kambula. There, instead of Chelmsford and Dumford we have Wood and Buller fighting deliberately on ground of their own choice, with four field-guns and two line battalions of veteran soldiers. On the Zulu side once again an impi of 24 000 warriors came on the attack, full of confidence after a string of successes, armed with the Martini-Henry rifles they had captured at Isandlwana and the Intombi Drift. The morale of the British could not have been lower, not only because of the reverses they had suffered since January, but also because of the disastrous failure on the previous day. On 28 March a carefully-planned attempt to storm the Zulu fastness of the Hlobane Mountain came amiss and Wood’s volunteer horsemen were severly mauled at the Devil’s Pass and on the lower slopes. So when the Zulu horns began to extend early on the afternoon of 29 March, the Imperial lion was in poor shape. Four hours later, after inspiring leadership by Wood, desperate firing by all defenders of the two laagers and fort, with more than one tense moment when the Zulus were about to burst in, the enemy broke. It made Kambula the turning-point of the whole campaign. The soldiers felt it at the time; they were glad to have saved their skins, proud at vanquishing a recklessly brave enemy, and thirsty for revenge. Only the letters of men who took part in the grim success of the British pursuit can convey something of the carnage that took place. One was written the next day by Friedrich Schermbruecker, the elderly commander of a corps of German volunteers and their sons, known as the Kaffrarian Vanguard. [Editors’ Note: This unit should not be confused with the Kaffrarian Rifles, although it is referred to as such in the Official History.] After manning the north-west face of the laager during the battle, these Cape volunteers (whose horses were already saddled and tied to the picket-rope) raced out after the retreating Zulus. ‘I took the extreme right’, he says, ‘Colonel Buller led the centre, and Colonel Russell with mounted infantry took the left. For fully seven miles I chased two columns of the enemy. They fairly ran like bucks, but I was after them like the whirlwind and shooting incessantly into the thick column, which could have not been less than 5 000 strong. They became exhausted and shooting them down would have taken too much time; so we took the assegais from the dead men, and rushed among the living ones, stabbing them right and left with fearful revenge for the misfortunes of the 28th (i.e., at Hlobane). No quarter was given’. 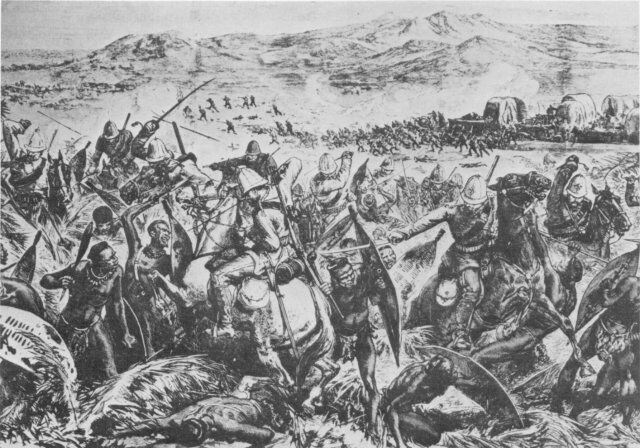 An artist’s illustration of the battle of Gingindlovu. The ferocity of the cavalry pursuit, which also characterised Kambula, is clearly illustrated. The original sketch was drawn by a senior British officer serving with Chelmsford’s forces, Col John North Crealock, who provided a constant supply of sketches to the ‘Illustrated London News’, in which publication this sketch originally appeared. These, then, are the gains from using soldiers’ letters – they reveal the pressures and predicaments of war as experienced by individuals and small units; the conditions under which they lived, worked, and fought; they have immediacy and a determinable time-context; they come from all phases of the war, active and passive; they illuminate little-known episodes and tell us of unsuspected ones. There is also the pleasure of appreciating the style in which they were written, sometimes terse and matter-of-fact, sometimes remarkably eloquent and vigorous pieces of composition. Consider this opening by a soldier of the 80th Regiment, written on 6 April: ‘Dear Sister and Brother, death has been very busy gathering his harvest in this country, counting his victims by tens of thousands, without respect of race or colour. With the advent of the New Year, war in all its horrors has been let loose upon South Africa, and still the storm rages’. (30) A little flowery for some tastes, perhaps, but a far cry from the picture of Tommy Atkins so often drawn by Kipling. ‘My little homestead in the city, which I recently insured for £2,000 would no doubt have shared the common fate, as the insurance companies will not make good that which is destroyed by the Queen’s enemies. And although I have a farm of 50 acres close to the town, no doubt the crops and premises would have all been destroyed. In fact, this has already partly been the case, and I am now suing the Government for the damages done by a contingent of 1 500 natives that have recently encamped not many hundred yards from the place, who have done much damage all round’. (32) It seems that war, as someone said of California, is a state of mind, and private letters reveal it pretty well. Emery, Frank. The Red Soldier. Letters from the Zulu War, 1879. London, Hodder and Stoughton, 1977, pp 17-26. I have used some material in my article, Soldiers’ Letters from the Zulu War a source of historico-geographical value. Natalia, No 8, 1978, pp 54-60. Arthur Harness (1838-1927) attended Carshalton School before entering the Royal Military Academy, Sandhurst, in 1853. He was awarded a brevet Lieutenant Colonelcy for his services whilst commanding N/5 Battery, RA, in the operations against factious tribes in the Cape in 1878. His part in troop movements at Isandlwana on 22 January 1879 is one of the more interesting revelations in his letters, edited by Sonia Clarke. Invasion of Zululand, 1879. Johannesburg, Brenthurst Press, 1979. Biographical details of each officer will be found in:- Mackinnon, J.P. and Shadbolt, S.H. The South African Campaign 1879. London, J.B. Hayward, 1973 (first published 1882). Ibid item 1 above, pp 196-199, 206-209. (a) Knight, Ian. Writing in Soldiers of the Queen. Journal of the Victorian Military Society, No 10,1977, p 28. (b) Crouch, John. Ibid. No 14,1978, p 24. Jobson, Allan. Victorian Suffolk. London, 1972, p 126. The letters of George Morris are filed in the Archives of the 24th (2nd Warwickshire) Regiment of Foot (subsequently the South Wales Borderers), at the Regimental Museum, the Barracks, Brecon. I am grateful to Mr David Jackson for letting me use his copies of them. Crouch, John. ibid item 5(b) above. Ibid item 1. above, p 20. 21 Letters from Natal, Zululand, and the Transvaal were published in The Sheffield Daily Telegraph between 4 March and 28 August 1879. Sheffield Daily Telegraph, 5 April 1879; his letter was dated from Rorke’s Drift, 20 February. Ibid item 14 above, p 79. Sheffield Daily Telegraph, 24 July 1879, dated 6 June from ‘General Wood’s Column, Amatakulu Camp, Zululand’, and continued on 11 June. Ibid item 1 above, p 222, 226. Ibid item 7 above; Chapter 3, Discipline and Crime in the Army’. The writer was not named; his letter was dated 29 June from ‘Flying Column camp’ and printed in The Eastern Province Herald for 18 July 1879. Sheffield Daily Telegraph, 28 August 1879. Captain W. Penn Symons’s reconstruction of the events of 22-23 January 1879 is filed in the Archives of the 24th Regiment of Foot (South Wales Borderers) at the Regimental Museum, the Barracks, Brecon. I have edited extracts from it, entitled, The 24th Regiment in the Zulu War: Isandhlwana, which is to be published by the Regimental Association in the near future. For example, details are given in letters published in The Birmingham Daily Gazette, 25 March 1879 (possibly by an officer of the 2/24th Regiment) and again 26 March from Arthur J. Secretan of the Natal Mounted Police, dated from Helpmekaar, 3 February. Sheffield Daily Telegraph, 5 July 1879, dated from Rorke’s Drift, 24 May. The letter, which had appeared earlier in The Cape Mercury, was printed in The Friend of the Free State and Bloemfontein Gazette for 1 May 1879; Schermbruecker wrote it on 30 March at Kambula. Ibid item 26 above, 1 May 1879. The letter by A. Brett was undated but probably written on 31 March, from ‘Camp Kambula’. It was printed in The Portsmouth Times and Naval Gazette for 10 May 1879. Brett may have been serving with the 1/13th Regiment’s contingent in the mounted infantry. Ibid item 1 above, p 202, 205, 233, 235-237. The writer, known only by his initials, served with the 80th Regiment (Staffordshire Volunteers); his letter was dated from Pretoria, 6 April, and was printed in The Sheffield Daily Telegraph for 17 May 1879. Major Walker was a senior and experienced officer of the 99th Regiment (Duke of Edinburgh’s), attached on special duties as transport officer to the relief column directed at Eshowe. After the battle of 2 April, he remained at Gingindlovu in command of the troops detached to hold it while Chelmsford and the main body advanced to Eshowe. He wrote his letter on 4 April and it appeared in The Irish Times, 23 May 1879. Sheffield Daily Telegraph, 17 May 1879. The writer was not named; the troops he complained of were most likely the remnant of the Natal Native Contingent, being prepared to serve as mounted men, because he says they ‘have from 600 to 800 beautiful horses’. He adds that ‘the men in command have little authority over them’, also that 12 March was proclaimed by the Lieutenant Governor, Sir Henry Bulwer, as a day to be set apart throughout the colony for humiliation and prayer.